Maritime Vinyl: Mike Bravener - Coverin Hank review! Mike Bravener - Coverin Hank review! 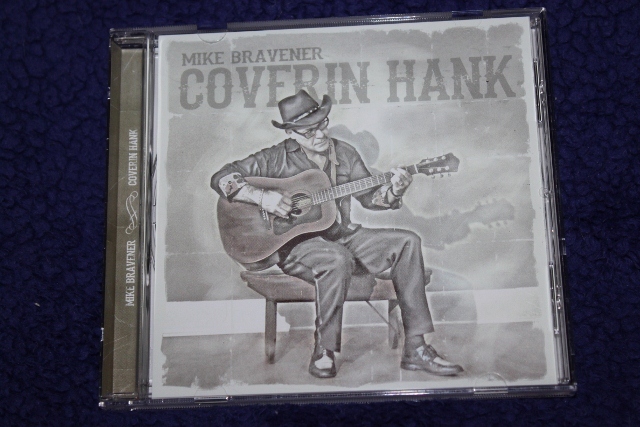 Mike Bravener is not a stranger to those involved in the local music scene here in Fredericton, NB. You may have seen him doing his uncanny Elvis impersonations at various events, playing guitar and harmonica outside the Boyce Farmers Market, or playing guitar with his son Josh at a local pub. Mike is the definition of passion when it comes to performing live music. He takes his performances very seriously and always looks to get a smile out of the person standing at the back of the venue who seems to be having a bad day. He is not shy, ask him if he knows a certain song next time you see him, but beware… if he knows it he will sing it loud and proud whether he is in the middle of a diner or library, as he should. 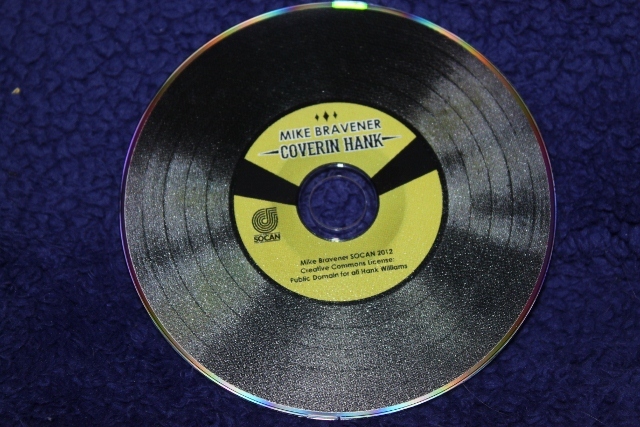 Coverin Hank is Bravener’s newest release which hits the market next Tuesday, April 2nd. 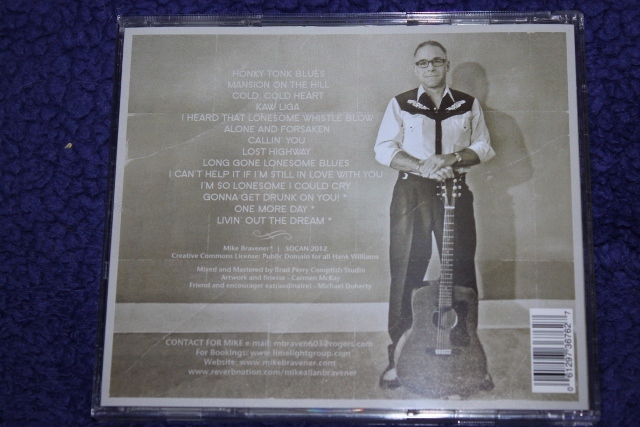 Eleven of the songs are cover versions of his favorite Hank Williams Sr. songs. It is uncanny how he can hit every note just the way Hank did. I’ve bumped into Mike at various times during the recording of this album and he was definitely in the “Hank zone”, living and breathing Hank Williams Sr. throughout the making of this album. It’s a fitting tribute to the legend that has been gone for 60 years now. The album covers the majority of the classics including Kaw Liga, Cold Cold Heart and I’m So Lonesome I Could Cry. My favorite part of this release, however, is Mike’s original recordings. My personal favorite of this album is his original closing track Livin Out The Dream which was written as a reflection. It gives thanks to all of the students and fans that have given him support over the years telling him “Never give up - hang in there – your dreams will come true.” The song is filled with passion, thanking God for everything in his life and is played in the same style that Hank would appreciate. The album was recorded in Mike’s basement with him doing all of the recording himself as well as playing all of the instruments. He sent the track for mixing and mastering to Brad Perry Comptish Studio. This album sounds really amazing and had I not known it was recorded in his basement, I would have figured it had been recorded in a professional studio. Some of the music is a little raw which really works for these old Hank tunes. As Mike says “sometimes a train rolling down the track hits a little bump and sway and sometimes life isn’t perfect so why should music be?” I see this raw sound as a bonus in the recording of this album and wouldn’t want it any other way. The Coverin Hank official CD release party is next Saturday, March 31st at Cedar Tree Cafe in Fredericton at 7:50pm. 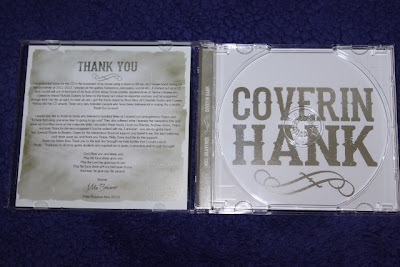 Cover charge is $15 and this includes a copy of the new CD handed to you by Mike himself. 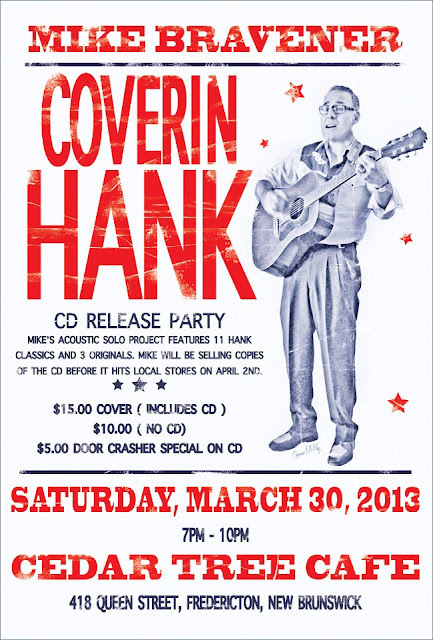 If you can’t make it to the release party, you can buy Coverin Hank at The Lighthouse Christian Bookstore in Fredericton or at www.mikebravener.com. For the Records - documentary review! Two Hours Traffic - Foolish Blood - Review! Why I love Stompin' Tom Connors! Crash course on David Bowie’s Low! Tonella - Compromise EP - review!